I've finally found it: A tomato trellis that won't blow over or collapse under the weight of my tomato plants. And it's made from common materials from the hardware store and uses just a few common tools. I don't know what it is about our little plot here in Southwestern Idaho, but the tomatoes love it here. I'm thinking it's the long, hot sunny days punctuated with very occasional rain storms. In previous years, I'd used the common wire tomato cages that you find every spring in most home and garden centers. And each fall, I ended up with a tangled mass that ended up in my recycling bin. The plants just got too big and heavy for the cages to withstand. Wood cages were no better. They rarely stood up to the moisture and weather after one season. Imagine this: an alternative to the tomato cage that is inexpensive, easy to build from common materials, uses few tools, and is nearly indestructible. Enter the conduit and rebar tomato trellis. I'd first read about the conduit tomato trellis in Mel Bartholomew's popular book, All New Square Foot Gardening. His plan suggested using one long piece of conduit, bent into a 3-sided square or rectangle. The hollow ends would then fit over two pieces of rebar staked in the ground. 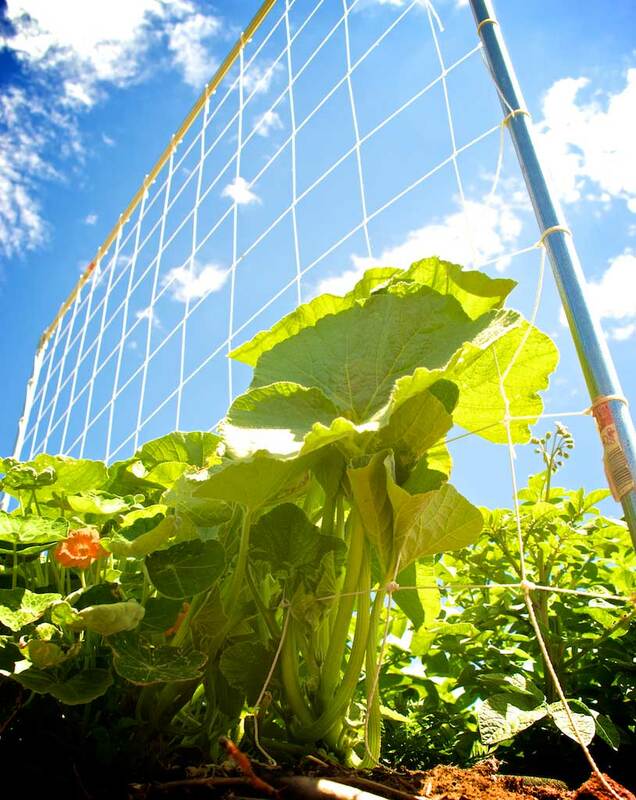 Pre-made trellis netting is then tied in the open space of the trellis. "Good idea," I thought. And went about my business, and mostly forgot about it. Then I discovered Reaganite71's YouTube Channel. This guy is awesome. A quick browse of his site shows you how to do things like spank your tomatoes, make drunken compost, and more. Who knew gardening could be so exciting? He has an amazing video on how to make a tomato trellis from conduit and rebar, but instead of purchasing trellis netting, he shows you how to tie your own trellis from nylon string. I had to try it. To learn how to make your own tomato trellis, watch the video. It's very informative and entertaining, and easy to follow. This trellis is so stout, I used it for my squash plants too! Those tomato plants look so cute and innocent... but they will turn into monsters. Just scroll down to see the great wall of tomato. I built two trellises for my tomatoes, and one for my squash. They're solid and very lightweight. I positioned the trellises east-west (since our prevailing winds are from the west, this should help reduce wind resistance). The east-west orientation also helps my growing tomatoes shade the bell peppers I planted on the north side of the trellis. As you can see, I even started tying trellis netting between the two tomato trellises. There are some tiny cucumbers that will grow up that portion of the netting. All told, I'm really happy with this project. As you can see, my tomatoes grew and grew. They were HUGE and got a teensy weensy bit out of control. They produced so many tomatoes, I had my neighbors coming over to pick them! The trellis setup worked so well. Once I cut the dead plants off at the end of the season, they looked as good as new. I left them outside all winter, and they're ready to go this year once again! Definitely the best tomato trellis I've ever used! Be sure to subscribe to Reaganite71's YouTube Channel! What's your favorite trellising method for tomatoes? Let me know in the comments below.